Pokémon Stadium is a Pokémon stage in Super Smash Bros. Melee, Super Smash Bros. Brawl, and Super Smash Bros. Ultimate located in Kanto. It is based off the stadiums used during the final battles of the Pokémon series. It is also based on the stadiums used in the game Pokémon Stadium. It looks like a simple stage, with two floating platforms, but on regular intervals it will change into one of four different terrain types: Water, Fire, Rock, or Grass. The stage also features a giant screen in the background showing a close up of the battle or sometimes the current leader of the match along with fireworks exploding in the sky. Unlike the stage Pokémon Stadium 2, no Pokémon appear in any of the different forms the stage changes into. The stage is featured in Stage 7 of Adventure Mode, which features the player going up against several Pikachu. After Jigglypuff and Pichu are unlocked, they will randomly appear amongst the Pikachu. There is also an alternate track that usually plays when Pichu is battled. It is called "Pokémon Gold & Silver", which is a combo of many of the battle themes from the eponymous games. 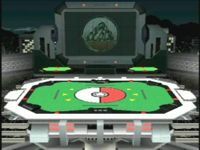 In Super Smash Bros. Brawl, there is also a similar stage called Pokémon Stadium 2, that is similar to this stage in concept, but alters the transformations. The original is also unlockable. In Super Smash Bros. Melee, the unlock matches for Jigglypuff and Pichu take place here. 3/00 Trainers come from far and wide to congregate at Pokémon Stadiums, the ultimate venues to show off their Pokémon teams. There are many different arenas with varying terrain designs, some of which afford advantages to certain Pokémon. This particular stadium is reserved for huge events and boasts a big screen and spectacular fireworks. In the prototype version, when the terrain changed, the screen changed to the type of the TCG card the terrain was based off of. This is the only Melee stage in Super Smash Bros. Brawl to have three selectable stage music. This page was last edited on March 12, 2019, at 15:28.